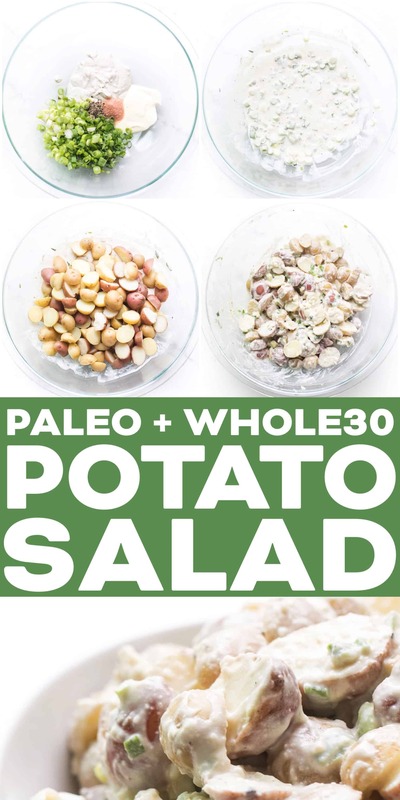 Paleo + Whole30 Creamy Potato Salad Recipe – a healthy dairy free picnic salad that is perfect for your summer bbq cookout! The best side dish to grilling recipes. Gluten free, grain free, sugar free, clean eating, real food. 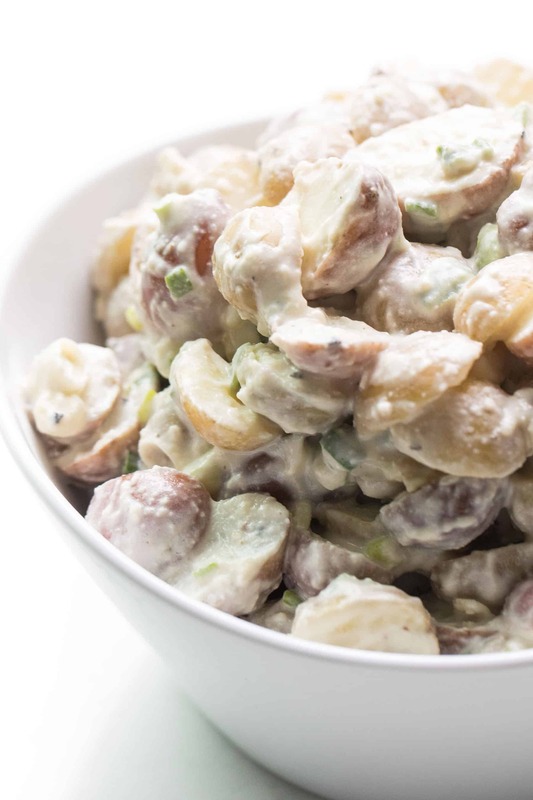 If you’re looking for a healthy, dairy free, super creamy and delicious potato salad, you’ve come to the right place! 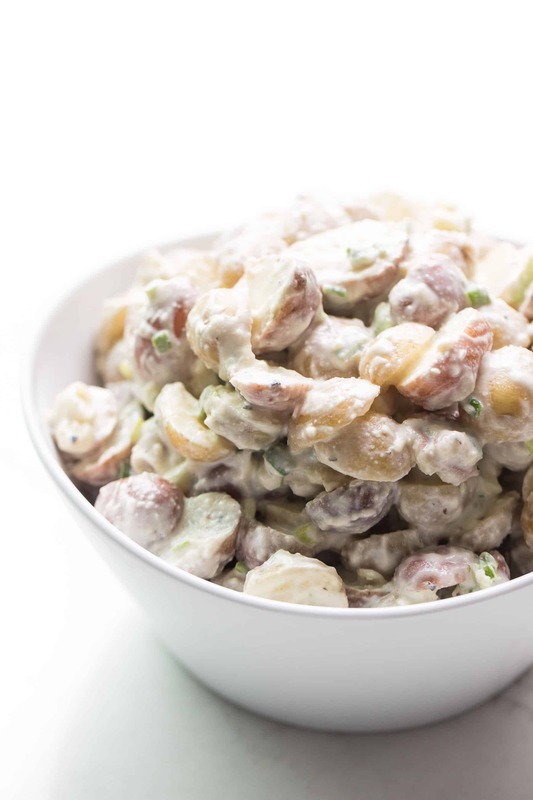 One of my absolute favorite side dishes of a summer grilling meal is potato salad. With perfectly tender potatoes, a creamy dressing, and crunchy pickles and green onions. 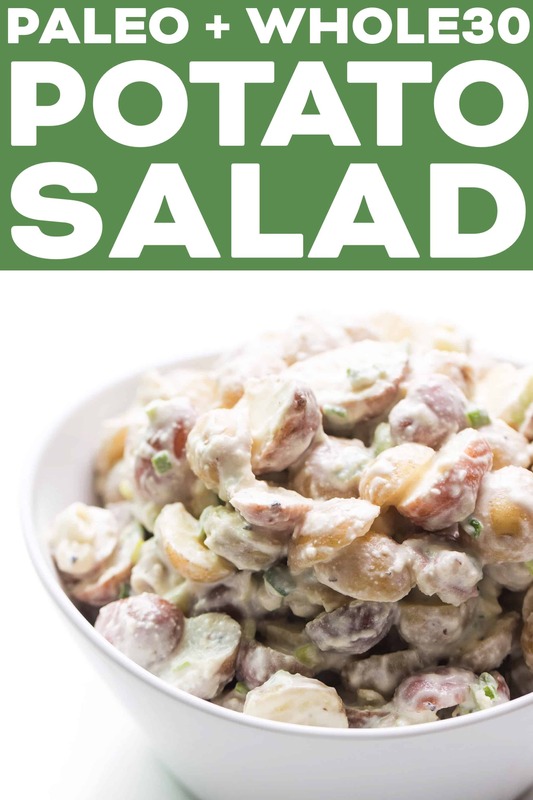 Sadly, most potato salad recipes are made with sour cream, heavy cream, milk and other dairy that upsets my stomach. 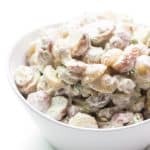 Even my own previous favorite potato salad recipe I shared on here and made all the time before giving up dairy used sour cream!Which is why I pass on eating it at BBQ’s. Luckily, I’ve perfected the perfect dairy free potato salad dressing! It’s a combination of 2 of my favorite paleo + whole30 homemade condiments. Cashew cream and mayonnaise. Both of these you’ll want to make yourself, but they both take less than 3 minutes to make. Very easy. The cashew cream tastes exactly like sour cream when you add in some acid (pickle juice in this case). It is amazing! So healthy and dairy free! The mayonnaise adds some tang and creaminess. I like to keep my potato salad recipe very simple. I use my dairy free salad dressing base of cashew cream and mayonnaise. Then add in some pickle juice for brightness and dill flavor. Salt and pepper. Last, some sliced green onions and chopped pickles for crunch and brightness. You can feel free to add in other ingredients you love also! This would be great with chopped celery. Or diced hard boiled egg. I personally don’t like hard boiled egg in my potato salad, which is why I leave it out. Fresh herbs like dill or parsley or chives would be delicious in here too! Have fun adding in what you love to make it your own. 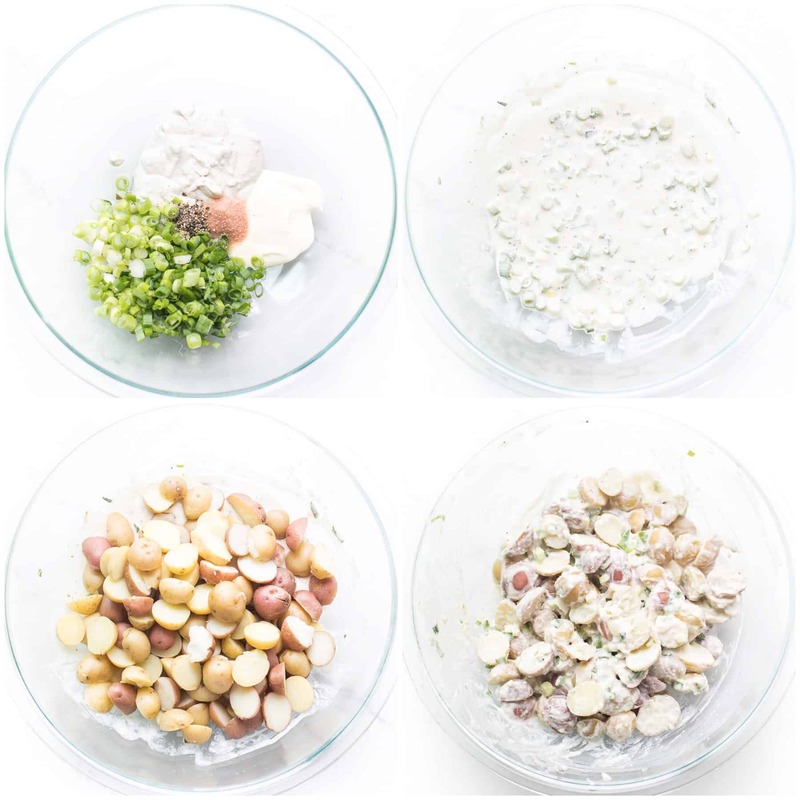 What Potatoes Should You Use for Paleo + Whole30 Potato Salad? My favorite potatoes to use are a mix of small red and gold potatoes. I get the big bag of organic mini creamer potatoes from Costco, which is a mix or small red and gold potatoes. It makes for the best flavor, plus it’s prettier to have some red potatoes in there too. Purple potatoes would be gorgeous in here too! The ones I get from Costco are so small I only have to cut the potatoes in half to make them bite size. If your potatoes are larger, cut them down to be bite size pieces. You don’t want too large of a piece of potato that you’ll have to cut smaller. 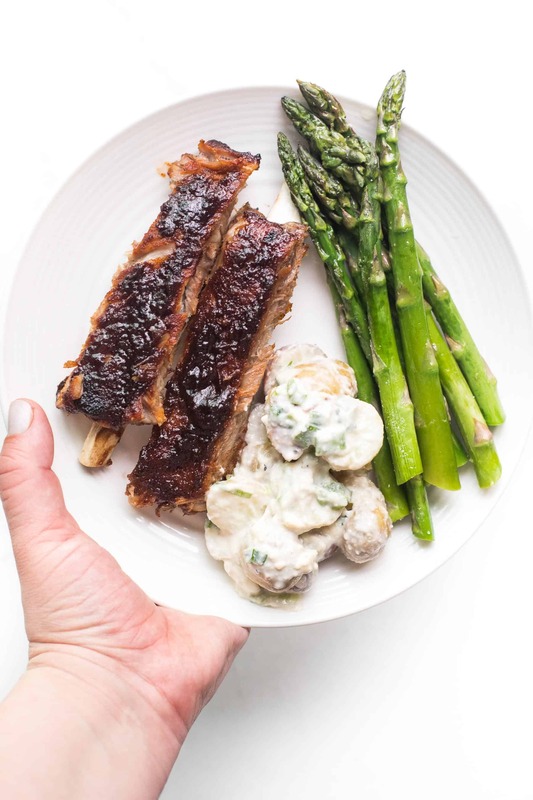 How Long Does Paleo + Whole30 Potato Salad Last? 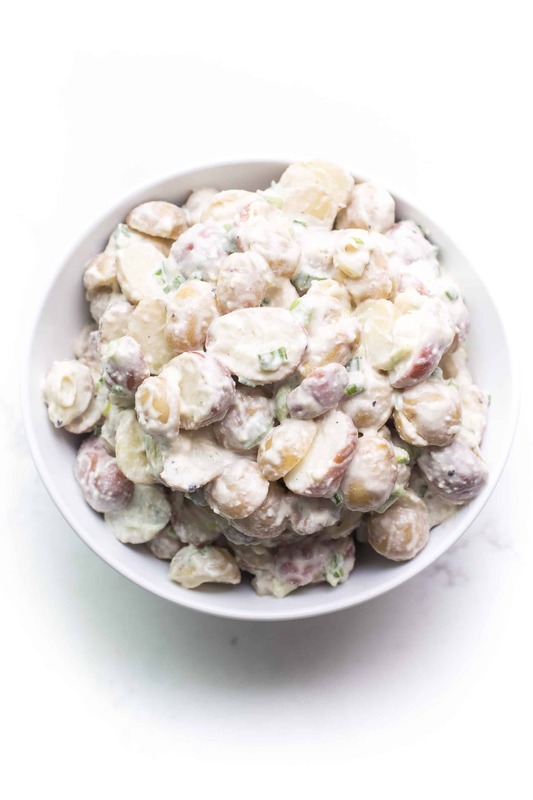 The potato salad will last for at least 5 days in an airtight container in the refrigerator. Usually longer. Just check for spoilage. This is great if you’re having a party or serving a crowd and want to get your side dishes cooked and ready in advance. Fill a large pot with water, and bring to a boil over high heat. Once boiling, add in the cut potatoes. Boil until fork tender, about 15 minutes. While the potatoes are cooking, make the dressing. In a large bowl, combine the cashew cream, mayo, pickle juice, sliced green onions, chopped pickle, salt and pepper. Stir to combine. Once the potatoes are fork tender, drain the water. Add the warm potatoes to the dressing. Stir to combine. You can serve the potato salad immediately while warm, wait 20 minutes until it is room temperature, or refrigerate and serve it cold. Will keep in an airtight container refrigerated for 5 days.